Just about everything has some type of acronym that it’s known by today. In the world of importing, there is a long list of acronyms or lingo to become familiar with like HTSUS. So what is the meaning of HTSUS? Simply put, HTSUS stands for the Harmonized Tariff Schedule of the United States. Ok, so now what does that mean? In basic terms it is a code based on a numbering system that categorizes goods. We will explain how it all works and focus on what HTSUS codes mean to importing goods. Let’s say a shipment of handbags are being imported. In order to assign a HTSUS code the name of the item, intended use and material are assigned a number. This numeric code is the classification of the goods. It is a 10-digit code specific to the U.S. for imports. The HTSUS evolved from the former Tariff Schedules of the United States or TSUS. President Ronald Reagan is credited for requested that the U.S. begin using the international numbering system to classify commodities. The Omnibus Trade and Competitiveness Act of 1988 became law replacing the original TSUS. 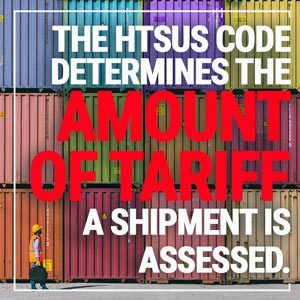 It is the HTSUS code that determines the amount of tariff a shipment will be assessed as it comes through U.S. customs. If an item is classified incorrectly it can cause a delay in clearing customs and additional fees may also be applied. The first thing importers need to know is that HTSUS codes are required for all import shipments. There is no getting around this when filing documentation for the shipment. Importers will want to make sure the HTSUS code is correct because it’s what sets the amount of duty. When dealing with importing, the process can be difficult in keeping up with all the needed documents and learning the lay of the land. The cost of using a licensed customs broker can certainly have a significant ROI when it comes to importing. And one area where their expertise is critical is in classifying a commodity in HTSUS. However, be forewarned that mistakes in classifying a commodity can wind up costing the importer more. 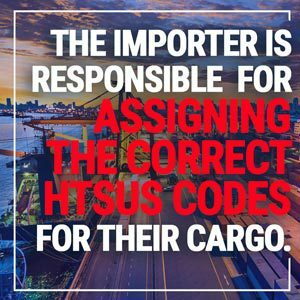 While importers are skilled at running their business, they often lack the knowledge of HTSUS codes. Every dollar counts in the import process. A licensed customs broker can help make sure importers do not pay more than required to get shipments through customs. The Customs Border Patrol (CBP) is the agency responsible for establishing duty rates. An additional resource to help importers estimate a duty rate is the Tariff Database by the U.S. International Trade Commission which publishes the tariff schedule. 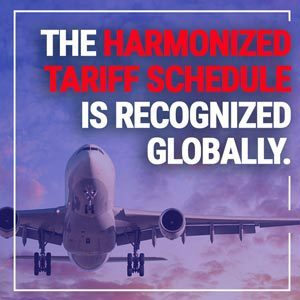 The Harmonized Tariff Schedule (HTS) is recognized globally. HTSUS codes for all commodities are included in this database. While importers can obtain an estimate of the rate, the exact amount comes from the CBP. Again there is no getting around this process. A licensed customs broker can be a valuable resource for importers during this process. Brokers are accustomed to navigating the database and cross-referencing information on behalf of clients. The customs broker understands how HTSUS codes work and what information is needed from the importer to classify goods. A number of changes were made to the 2018 tariff code including adding new code as suffixes for products like antenna parts or gift wrap ribbons. The HTSUS code, described expansive, continues to evolve as adjustments are made or items are added to the classification list. Can licensed customs brokers assign HTSUS codes for imports? The short answer is yes, licensed customs brokers can handle assigning HTSUS codes for imports. Once contracted and with power of attorney the broker is working on behalf of the importer. However, in the eyes of the CBP it is ultimately the responsibility of the importer to make sure the cargo is classified correctly and assigned the right HTSUS codes. A good rule of thumb for importers is to work closely with the licensed customs broker on documentation. The details the customs broker needs to assign HTSUS codes for a shipment comes from the importer. It is critical for the importer to provide sufficient information about the products to determine the classification for HTSUS codes. The importer should not just walk away from the process once the customs broker begins the process. The broker needs the importer to remain involved to make sure the documents are correct and both are aware of what is outlined throughout. Customs brokers can explain the process to importers and answer questions regarding HTSUS codes. The importer does not want to spend unnecessary funds to cover duty, taxes and fees at the point of entry. In order to ensure cargo is assessed proper duty rates, the information from the importer is critical. Importers need to know a number of specific details about the freight being shipped beyond its intended use upon arrival. Those details will need to be outlined since each facet is categorized to determine the HTSUS codes to be assigned. Customs bond agents will have the importer provide this detailed information and seek more specifics as needed. It’s better to start with correct information to expedite the process rather than slowing things down if something is missing. The process of importing can be trouble-free with a few key tips relating to HTSUS codes. A licensed customs bond agent is available to help importers manage the process including assigning HTSUS codes. 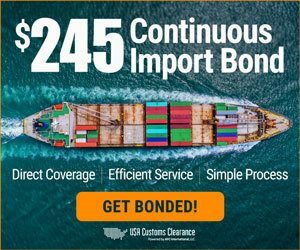 For help with continuous bond or to learn more about USA Customs Clearance and how they help importers make sure all documents are in order. By working closely with licensed customs bond agents, importers ensure the right HTSUS code is provided for duty, taxes and fees at the port of entry.